Graydon: And then they're on the roof! Clifford: Why are they on the roof? Graydon: Because those are the rules! Included by Roger Ebert in his Book of Hollywood Clichés under the name Fallacy of the Climbing Villain. A villain pursued by the good guys comes to a tall tower, steeple, stairwell, or building. He starts to climb. This would clearly lead to his getting trapped at the top, like a cat tree'd by a dog. An ordinary person in a state of panic may have done this on instinct, but for a criminal mastermind, it is unlikely. To do this after one sees what happens to climbing villains is also a clear case of Genre Blindness. Ebert could just as easily have called this one The Fallacy of the Following Hero, as when a villain trees himself at the top of a building or other high place, instead of just staking out the bottom and waiting for him to come down, the hero has to go up after him. If it's a dangerous climb, the hero will probably drop his gun on the way up and have to fight the villain with his bare hands. Even if that doesn't happen, it will be a long, scary showdown, probably with a Literal Cliffhanger moment or two (see also Take My Hand). May involve Climbing the Cliffs of Insanity. Generally, the villain falls to his death, but occasionally, the hero takes him alive or even saves his life, and the villain agrees to come quietly. A common subversion (that makes more practical sense) is for the villain to have a Black Helicopter revved up and ready to leave on top of whatever he is climbing. Alternatively, said helicopter can arrive Just in Time in true Gunship Rescue fashion and sweep him away. During the 1980s, this trope was largely replaced by the Darkened Building Shootout and Executive Suite Fight. Appears at the climax of Ghibli's Tales from Earthsea, but note that in this case, the villain is a wizard who waits until the hero is at the very top of the building before collapsing the whole thing. The climax of the Ranma ½ movie Big Trouble In Nekonron China. Not only does the cast have to fight its way up a mountain, fighting Kirin's henchmen along the way, but he has taken Akane to the top of his tower at the summit. The Nerima Wrecking Crew (minus Ranma) arrives to rescue her, but are easily knocked out in a single attack, so Ranma has to take it upon himself to fight Kirin. In the end, since the tower was built on top of a hot spring, Ranma's Hiryuu Shoten Ha attack makes the entire thing explode in a gigantic waterspout. Fate/stay night, Fate route: Saber versus Rider. The final confrontation in The Castleof Cagliostro takes place as the Count and Lupin battle it out while climbing a clock tower. One of the many villains to usurp the throne of The Trigan Empire was confronted by the Emperor Trigo and actually attempted to escape by climbing his own Lady-Liberty-sized statue. Trigo followed, and only when standing on the upraised hand did the baddie think to pull a gun on him. The baddie then slipped, but Trigo caught him and brought him down to "use his genius for the good of the Empire." What a guy! In Bookhunter, when library police swarm the apartment of their book thief, they find it's empty. Agent Bay realizes the apartment was only vacated a few minutes ago, and that the thief must have taken the window fire escape. Sure enough, the thief climbs up, rather than down; Bay follows, and a rooftop confrontation ensues. In Batman #1 from the spring of 1940, Dr. Hugo Strange creates "monsters" out of people from the psych ward by giving them growth hormones to make them huge. The last one Batman fights climbs to the top of a building in order to take a swing at Batman, who is in his Batplane. Knowing Bob Kane's propensity for such Shout Outs (or just outright ripping plot points off), this is almost certainly a reference to King Kong (1933). Robin Hood - Robin tries to escape Prince John's burning castle until he jumps into the moat below. Mulan - The final part of the Mulan/Shan Yu fight takes place on the roof of the Emperor's palace. In The Princess and the Pea, Laird and Hildegard take Daria to the top of the castle, and Rollo follows them up there to rescue her. Older Than Television: King Kong did this way back in 1933, treeing himself at the top of the Empire State Building. Justified in that Kong was not exactly a mastermind and was likely operating more on jungle/mountain/island instinct than anything else. Used at the climax of Tim Burton's Batman (1989), when the Joker flees up the steps of (the surprisingly tall) Gotham Cathedral, taking Kim Basinger's Distressed Damsel (surprisingly so for a movie made in the last months of 1989 - it's like she was paid per scream) with him. Justified on the Joker's side, since he radios ahead for a helicopter pickup and thus knows he won't be trapped, and takes repeated measures to stop anyone from following. Batman's inevitable pursuit is also somewhat justified by his concern for the Joker's hostage (plus his professional familiarity with Building Swings). Inverted in Blade Runner, where the hero (Deckard) flees to the roof of a building while being pursued by the replicant Roy Batty. In Psycho Beach Party, Chicklet flees from the murderer by climbing up a movie billboard, because they were in the middle of nowhere at night. Angus in Seachd The Inaccessible Pinnacle. Used by a hero this time in the 2007 Transformers movie during the climactic battle at the end of the movie. Sam runs up a tall building (using an inside staircase) while carrying the Allspark, during which Megatron follows him by just bashing through the different floors. Justified because an Army Ranger radioed for a helicopter to meet him on the roof of said building. Said helicopter was then shot down by another bad guy seconds before it grabbed the Allspark from Sam. North by Northwest - On top of Mount Rushmore. This one was parodied by Family Guy and the live-action Richie Rich movie. Saboteur - In the torch of the Statue of Liberty. Parodied (and subverted) by The Wrong Guy - it was a miniature. Vertigo - At the top of the same clock tower where the first pseudo climax occurs; justified in that the protagonist was attempting a Pull the Thread. In the climax of True Lies, Eliza Dushku steals the key needed to set off the bad guy's bomb, and then runs up the stairway, barricading herself in the building. Justified in Darkman, where the agile villain explains that his father had made him do construction work on skyscrapers early in his career. Luring Westlake to the top of a half-finished building, where he's more comfortable with the terrain than the hero, is an intentional ploy to cancel out Darkman's enraged strength and pain-resistance. In White Heat, Cody Jarrett climbs to the top of a gas storage tower to escape from the police. Rather than follow him, the police just shoot him, whereupon he shoots into the tower shouting, "Made it, Ma! Top of the world!" right before it explodes. Used in For Your Eyes Only, in which Bond prepares to scale a mountain to reach the monastery located at its summit (there's no other way to reach it without being detected by the bad guys). Unfortunately, the bad guys ARE guarding the cliff, and one of them nearly sends Bond plummeting to his death. Also done in GoldenEye, where the climax takes place atop the giant satellite dish the villain is using to control the titular superweapon. Unlike most examples, though, it's the villain that's chasing Bond (who's trying to disable the dish) rather than the other way around. In The World Is Not Enough, Electra King runs to the top floor of the castle while fleeing Bond. Zigg-zagged with the Cigar Girl, who flees to a hot air balloon, but blows it up instead of using it to escape. Subverted in Casino Royale (2006), when Bond chases the courier, who is a Parkour expert. Yes, at one point, he flees to the top of a crane, but he has the skills to get back down safely. In Scotland, PA, the final confrontation happens on top of the local fast-food restaurant. Beautifully subverted, and possibly parodied considering what happened right after, in The Other Guys where Samuel L. Jackson and Dwayne "Rock" Johnson chase a bunch of bank robbers upstairs to the roof of a building, who proceed to ride a zip line down to the street. They cut the zip line and make their getaway. This has got to be one of the funniest scenes in a movie because Samuel and The Rock are so caught up in their celebrity that they attempt to jump off the building to catch the bank robbers. Hilariously the camera follows them as they leap and fall all the way to go splat on the pavement. Theatre of Blood climaxes with Edward Lionheart scaling his abandoned theater hideout, late daughter/accomplice in arms, in order to give some knowingly Famous Last Words (quoting Shakespeare one last time) to the crowd below before falling to his death. The Triumph Of Sherlock Holmes, a film otherwise remarkably faithful to The Valley of Fear, ends with Moriarty, of all people, doing this. A Shout-Out occurs in the final scenes of The Rocky Horror Picture Show. A Justified example in Ministry of Fear. As Stephen and Carla exit her apartment, they see Nazi spies climbing the stairs below them. This leads them to flee to the roof. Al Capone's trial in The Untouchables is interrupted when henchman Frank Nitti flees to the roof of the courthouse after shooting a bailiff. Possibly echoing the King Kong example, Ghostbusters (1984) climaxes with a showdown atop another building in New York. Lampshaded (as with everything in the film) in that the actual climb is extremely anticlimactic. The climb is justified within the plot in that the villain seems to be doing perfectly well at ending the world from where they are and the trope is played straight again with the giant Mr Staypuft scaling the building in proper King Kong fashion to get at the Ghostbusters. 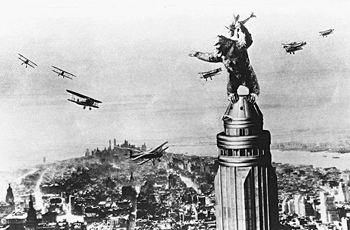 A the end of King Kong Escapes, King Kong and Mechani-Kong fight atop Tokyo Tower. The final fight in Sherlock Holmes (2009) between Holmes and Lord Blackwood takes place on the half-built Tower Bridge. Indiana Jones and the Temple of Doom ends with Indy and the evil cultists climbing up a fallen rope bridge. At the climax of Curse of the Crimson Altar, Morley climbs on to to the roof of the Lodge as the building burns. He is last seen screaming defiance at the heavens as an image of Lavina appears above him, before the roof gives in and he plunges into the burning building. Spoofed in Labyrinth, when Ludo climbs to the roof of a simple house from the inside during the Battle of the Goblin City. On the other hand, he's at a convenient location to summon rocks and turn the tide of the battle. In Reform School Girls, Edna attempts to escape the rioting girls by climbing the same tower that Lisa hd jumped from when she committed suicide; firing a shotgun at them as she goes. Charlie then crashes a bus into the tower, causing it to catch fire. Referenced in Robert Rankin novels; one of the four sets Private Detective Lazlo Woodbine uses is a rooftop, for climatic battles. In Memory, Sorrow and Thorn, everyone and their grandmother (seemingly) climbing up the massive staircase to the top of Green Angel Tower is the buildup to the big climax at the top. It even starts below ground for several characters, as the tower descends at least as far beneath the surface as it does above. In A Shadow Girls Summer Of Love And Madness, this trope is invoked twice by the villain. Doctor Who: The climax of "The Woman Who Fell to Earth" takes place as the heroes and villain rush to the top of two cranes, as the operator of one of those cranes has been randomly selected as the target of an alien ritual hunt and the Doctor and company are trying to save him. In the Inspector Morse episode "Service of All the Dead", Morse pursues the murderer up a church tower. This is lampshaded in the original book; it mentions that, later, Sergeant Lewis asked Morse why he didn't just lock the murderer in and call in reinforcements. While the final episode of Maddigan's Quest sets this trope in motion as a trap for the heroes rather than the villains, it's largely played straight from there on in. The children make it to the top of Solis tower with the solar converter, where they are greeted by the Duke of Solis and betrayed by Timon. Maddie, Boomer, and Yves arrive, and in the resulting chaos, Ozul and Maska fall to their deaths, Timon reverted back to his usual self, and Solis is saved. Professional Wrestling abuses this trope in the "Hell in a Cell" gimmick match. For the uninitiated, it's a match in which the ring is entirely enclosed by a huge cage (with a roof). Ever since Mick Foley took a bump off the thing in a match with The Undertaker in 1998 (and, actually, they started on the roof that time...), a significant percentage of matches have involved the heel "escaping" by climbing the cage, and terrible, terrible things happening as a result. It's been toned down in recent years, but WWE video games still keep the trope alive by having breakable panels on the roof and specific animations for being thrown off. The thing that makes the Mankind-Undertaker match a CMOA is that after 'Taker tossed Foley off the roof, Foley managed to get back up, climb the cage, and get chokeslammed through the cage. This trope is the entire point of ladder matches and other Gimmick Matches that are won by climbing and retrieving some object. At the end of Dino Attack RPG's Final Battle, Dr. Rex climbed to the top of Dino Attack Headquarters and battled against Dino Attack's T-1 Typhoon fleet. A variation of this happens in Half-Life 2: Dr. Breen runs from his office near the top of The Citadel to the nearby Combine Portal, which he intends to use to leave Earth while simultaneously killing Freeman. Said machine slowly lifts him up to the portal via a shielded platform, and you basically have to reach the apex before him and shut the gateway before he escapes. By that point, you're very high above City 17. The opening video of Baldur's Gate is build around this trope, only that it's (apparently) a hero who is chased to the top of the tower by a villain, only to be promptly thrown all the way back down. Is Sarevok badass or is he badass? The video game Mirror's Edge features the final level, the Shard, the tallest building in the city. In a bit of a variation, protagonist Faith isn't necessarily chasing the villain to the top of the tower - at this point, she still doesn't know who the real villain is - but when she inevitably gets to the top of the tower, the Bad Guy jumps into a helicopter to fly away. In the climax of Final Fantasy XII, Princess Ashe is first tasked by the Occuria to cut a shard of the Sun-Cryst to destroy The Empire and take back her kingdom. To reach it, she must climb the hundred-floor Pharos Lighthouse, atop which the Sun-Cryst—and many revelations of herself, the Occuria, and her enemies—reside. Furthermore, at the end of the story, the party infiltrates Sky Fortress Bahamut and pursues Vayne to the topmost balconies, confronting him in a Final Battle. The lighthouses in both Golden Sun games. The overworld of Donkey Kong Country 2 sees Diddy and Dixie climbing Crocodile Isle, culminating in the vertically-oriented levels of K. Rool's Keep. But when they reach the top, K. Rool's Cool Airship swoops in and lifts him and the trapped Donkey Kong away. The original Max Payne subverted it with the last level, where Max ascends to the roof of a skyscraper, only for the Big Bad to board a helicopter. Armed helicoper. The sequel plays it straight, however. Justified in Dragon Age: Origins, where the Big Bad is a giant, flying, demon-possessed dragon god, who's decision to retreat to the top of Fort Drakon to confront the party comes after Riordan had performed a Blade Brake that crippled one of it's wings, thereby forcing it to land. In the Tomb Raider (2013) reboot, Lara has to scale a mountain that's being torn to pieces by a storm born of Himiko's rage, avoid lightning strikes and debris ripped off the mountain by gale force winds, and outrun a horde of undead samurai below her. Unlike with most examples, the climb itself is the climax, rather than used to build up tension for the final confrontation. Though it's used for that, too, the climb itself is climactic enough to count. The finale just makes it even cooler. In Mass Effect, due to the lifts to the Council Chamber getting halted via the lockdown, Shepard and squad are forced to EVA and "climb" up the outside of the Citadel Tower in order to reach Sovereign. "Dramatic fight scene while climbing" is the bread and butter of gameplay in Shadow of the Colossus, but this trope still comes into effect with the final boss, who is a mile tall. Super Mario 3D World has a climax in which after Bowser uses a Cat Bell power up, you have to climb his tower, which stands right in front of you. The only question is who's being chased, Bowser or you? In any case, you have to climb the said tower to the top. The final showdown with Damien Brenks in Watch_Dogs takes place at the top of their hideout at the Chicago Harbor lighthouse. They even lampshade it as you're climbing up: "Seems fitting. Everything reeks of conclusion". Happened earlier during the attack on Rossi-Fremont, where the final confrontation with Iraq happens on the unfinished part of the building's roof. The Kill Michael ending in Grand Theft Auto V, after Franklin chases Michael to the oil refinery. Franklin even lampshades it a couple times. Justified as Michael is a film buff, has a tendency to make things overly dramatic and has just crossed the Despair Event Horizon, so he knows that this is his last stand. It's a lot more climactic when it happens again in Ghostbusters: The Video Game, with Mr. Stay Puft scaling another building to get at the girl. This time around, there's no opportunity for Crossing The Streams and the 'busters have to resort to just melting his face with their arsenal of experimental equipment. It happens twice in Jak II: Renegade, both leading into Boss Battles. The first time involves Jak climbing Haven Palace and is caught out by Baron Praxis. The second occurs late in the game. Jak and Daxter must get through the levels of a weapons factory to stop their ally Krew from completing a weapon that is in actuality a Doomsday Device. Krew refuses to back down. The final leg of The Very Definitely Final Dungeon of NieR: Automata is a dramatic ascent up a tower, with your two protagonists taking turns battling two bosses as they ascend in a flight unit/elevator before they reach the top and team up to battle the bosses' Fusion Dance form and then each other. In the Thundercats 2011 episode "Omens Part One", this is Inverted when a Chase Fight Gladiator Games ends with protagonist Lion-O knocked off a giant treetop arena and into the surrounding water, soundly trounced and publicly humiliated by his brother Tygra as he rings a bell in triumph and the audience in The Thunderdome goes wild.